Note from shop owner Closing for the Holiday Season. 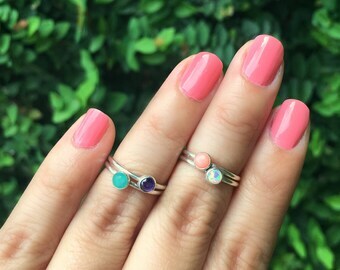 Please follow me on Instagram https://www.instagram.com/awljewelry to stay in the loop! Closing for the Holiday Season. Sword pendant was exactly as described, my husband loves it. Would definitely buy from this vendor again. Excellent - Absolutely love this item, have been waiting a long time to purchase one so glad to be able to buy one. Fantastic service and delivey was quick - Highly recommend alwayzwithlove you wont be dissapointed. Look like Bill Spencer with your very own sword! Exclusively at AWL Jewelry. We've got the scoop! These gemstone midis are a delicious treat! AWL Jewelry as seen on TV. Proud to be the creator of the Spencer Sword necklace worn on the daytime soap: The Bold & The Beautiful! Natural stones and ethically mined silver. 100% Handmade Jewelry. Made in the USA. AWL Jewelry on the cover of People Magazine. Hi! My name is Adriana, and I am the designer and bench jeweler of AWL Jewelry. I am a one-woman operation working out of my home studio (its a corner in my garage) in sunny Miami, Florida. All jewelry is hand-made by me out of recycled fine and sterling silver. Born and raised in Colombia, I started out my young adult life as an anthropologist, loving the studies of ancient cultures; however, after graduating and through the twists and turns of fate too long to explain, I found myself in the USA getting my jewelry diploma from Miami Jewelry School. I became immediately fascinated by the jewelry fabrication process and couldn't stop. My jewelry training has allowed me to make beautiful jewelry that I am passionate about, so much that I started my own business. Now, all the jewelry I make is made from a corner in my home garage. It's a small beginning, but I'm very happy and proud of where I am today. Hard work pays off! It truly does! I make everything from earrings, to pendants, to chains, to rings, ALL from scratch. I love to create and fabricate and love to share my craft with you. I am easily amused, and entertained. I get uncontrollable giggles at the wrong times. I enjoy hiking, wine, movies, dancing, laughing and walking my dog. I am scared of spiders, and cockroaches. I love Jesus, my husband and jewelry making. Rocco is the coolest German Shepherd mix you'll ever meet. He's a hurricane Katrina rescue who understands English & Spanish, loves bacon, long walks, tummy rubs and play time. His duties are studio security and post office car ride passenger. A lovely shop where every piece is hand made by me in Sterling and Argentium Silver. Finely crafted with utmost care, just for you. Please read the items description carefully before making your purchase. I make every effort to accurately represent my items through photos and descriptions so my customers know exactly what they are purchasing. I provide measurements on request, so it is the buyer's responsibility to ensure that the item will fit properly. Personalized & Custom Orders: All Personalized and Custom Made (made to order) items are carefully handmade just for you! Unless I made the errors such as misspelling names or sending wrong items, there are NO REFUNDS/NO RETURNS for custom made and personalized orders. Any item that has been modified at your request is non refundable or returnable. I will only issue a refund or exchange items that have not been customized. If you would like to return your non customized piece, please contact AWL Jewelry within 7 days of delivery. The jewelry must be returned undamaged in its original AWL Jewelry packaging within 14 days of receiving the jewelry. The customer is responsible for shipping the package back to AWL Jewelry, and will be given a full refund. Every package is shipped via USPS, insured, with tracking and delivery confirmation. If unfortunately your package is lost/stolen/damaged in transit, AWL Jewelry will only be able to issue refund on the sold item once a case has been opened and the insurance is successfully claimed from the postal service. If a package is returned to AWL Jewelry due to an incorrect address/undeliverable address and you would like AWL Jewelry to resend it, you will be responsible for return shipping costs. My goal is to provide you with an excellent shopping experience. I love my customers and try to do everything I can to give you great service. I am available through etsy message, or email at adriana [!at] awljewelry.com. Feel free to drop me a note and I will be happy to help. Payments are through PayPal, Direct Checkout, or Etsy Gift Cards. Advanced payment is required for all Custom Orders. All orders will be shipped via USPS Insured with Tracking Number. Your order's Ready-To-Ship date varies depending on your item's fabrication time. Please read your item's description carefully for an estimated ship by date. All jewelry comes packaged beautifully and carefully in an environmentally friendly recyclable jewelry box, ready to be given away as gifts. I will ship to your ETSY address only. Please make sure your address on file with Paypal matches the one on file with Etsy. If you purchased a custom made order please allow up to 1-4 weeks for shipping. All orders are shipped via USPS First Class Mail, insured, with delivery confirmation. Shipping costs include processing fee. All orders will be shipped via United States Postal Service (www.usps.com), Insured, with Tracking Info. First Class 2-8 weeks to arrive after order has shipped. Priority: 6-10 business days to arrive after order has shipped. Express: 1 business day to arrive after order has shipped. International buyers are responsible for ALL import fees, and customs restrictions. Full value of the item will be declared on the customs form. Once shipped I have no control over extra fees, delays or confiscation at customs in your country. International shipments are going to take several weeks to arrive. Your order's Ready-To-Ship date varies depending on your item's fabrication time. Please read your item's description carefully for an estimated ship by date. After an item has shipped, it can take up to 2-8 weeks to arrive, depending on the destination and/or holiday season. Remember that once the item is shipped, I have no control of the speed of our postal service and I am very appreciative of your patience! * Please note that I will follow all applicable United States laws relative to trade restrictions, sanctions, and embargoes. At this time shipment is prohibited to Iran, Syria, North Korea, Cuba, and Libya. -Do not rub lotions or spray perfumes while wearing your jewelry. -Take your jewelry off when cleaning. Chemicals will tarnish your jewelry black. -Always store your jewelry in an oxygen and humidity free environment. Place it in a bag, sealed box, or container. -Never leave your jewelry in the bathroom. -If you perspire heavily, sweat will turn your piece black overnight. Acidic PH will cause your sterling silver to tarnish at a higher speed than people with an alkaline PH. Please contact me if you would like your piece rhodium plated before use. The coating will protect and prevent your sterling from tarnishing as quickly. -Use anti-tarnish strips or polishing cloths to prevent your piece from turning black. I do not consider a transaction complete until you are 100% satisfied! Positive feedback helps my small business grow and I am very appreciative of a 5 star review. Although 4 star reviews are good generally speaking, in the Etsy platform, it can have very negative consequences for a seller's shop. Please contact me if you have a questions/concerns with your order and give me the opportunity to remedy any situation (if any should arise) for you before leaving feedback. Is your jewelry made of real silver? Yes! AWL Jewelry is handmade with sterling silver (.925) and/or natural gemstones. It is safe to wear as it does not include lead, cadmium or other hazardous materials. Go to your profile > Purchases and Reviews > Track Package. If you can't find your invoice, feel free to contact me and I will provide you with your tracking details ASAP. How do I prevent tarnishing? -Always store your jewelry in an oxygen and humidity free environment. Place it in a bag, sealed box, or air-tight container. -If you perspire heavily, sweat will turn your piece black faster. Take jewelry off when exercising or dry it with a cotton cloth if you forget to take it off. 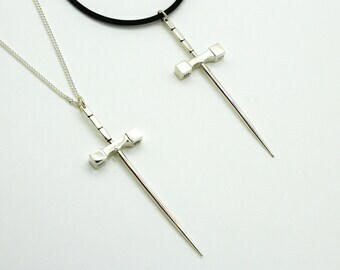 -Use the complimentary anti-tarnish strip/polishing cloth to prevent your piece from turning black.